Understanding the impact of advertising spend and knowing how various parts of an ad campaign contribute to sales is key to measuring impact on overall advertisement strategy. Traditional solutions that provide such analytics includes an ETL tool to transform and transfer data from one system to another, a data warehousing system that can store large amounts of data and run computations on it, and finally a visualization system that allows end users to interact with the data. This architecture with systems from different vendors adds to complexity and is unable to provide information to end users in a timely manner. In addition such solutions lack capability in two key areas – mobile access and ability to perform predictive analytics. In this article we’ll walk you through the ad analytics app we built on Google Cloud Platform and Salesforce products. 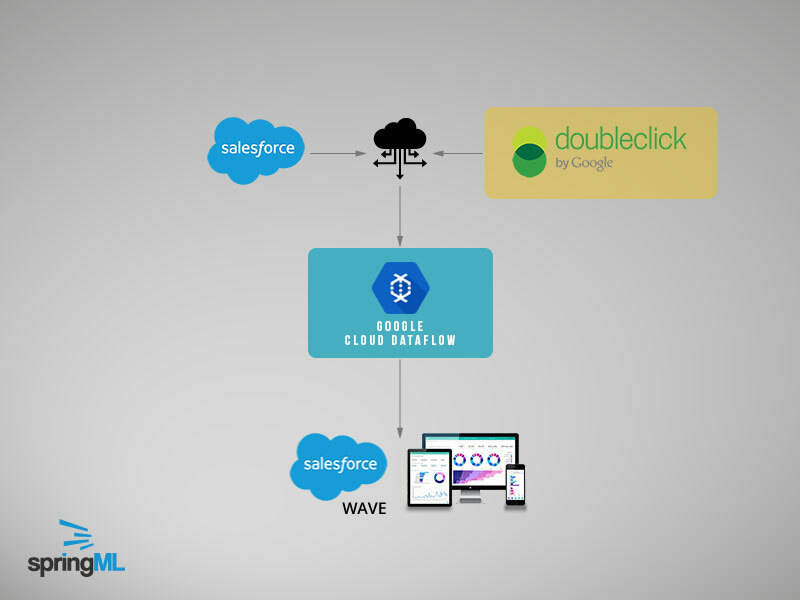 Google Cloud Dataflow and Salesforce Wave provide cutting edge technologies that can make the ad analytics solution simple yet very powerful. Salesforce.com provides the CRM and Visualization platform. 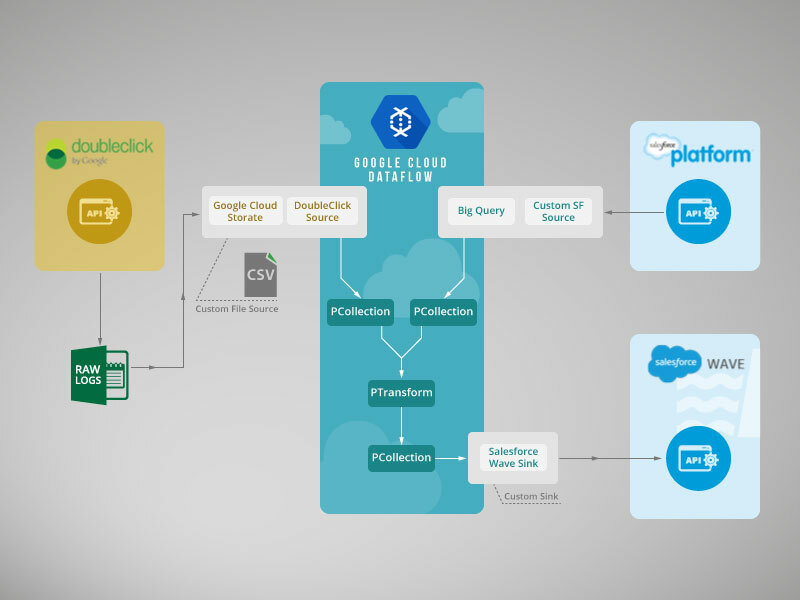 Google Doubleclick provides the ad serving platform, Google Compute Engine and Cloud Dataflow provide ETL and data enrichment and summarization capabilities. Let’s take an example of a media company that uses Salesforce.com as their CRM system to track prospects and customers who are essentially advertisers. When a media company salesperson closes an opportunity in Salesforce with a status of Won/Closed, it’s entered in Doubleclick as an order. Doubleclick then proceeds to serve the ads. However Media company salespersons or users at the advertiser company lack visibility into ad performance. Due to lack of timely information, they may be unable to make any real time changes to ads. For example, if they notice that the ad is performing poorly in a particular age group or a geographic region they may want to take appropriate steps to target their audience better. Google Cloud Dataflow provides a platform to process large data. Once data is processed and enriched, it can be pushed to Wave using a Cloud Dataflow connector. End users can then run various visualizations and view dashboards to get insights. Sales teams can easily access Ad performance in the same platform they are used to (SFDC) and compare Ad performance across regions and customers. The entire solution is built on a solid foundation with just Google Cloud Platform and Salesforce platforms. The solution provides near real-time insights with drill down dashboards and out of the box support for native iPad and mobile device interaction. Here’s a sample visualization in Wave after Doubleclick data has been encriched in Google Cloud Dataflow. These visualization and dashboard capabilities make powerful insights accessible to end users via a browser or mobile device allowing them to make proactive decisions. Let’s take a deeper look at how this is all made possible. Here is the technical architecture that we have developed for our ad analytics app. On the left hand side in the green box is Doubleclick. On the right hand side there are a couple of different Salesforce boxes in blue. The top one labeled Salesforce Platform refers to the Salesforce CRM platform. The bottom blue box refers to Salesforce Wave analytics platform, and this is where the enriched and summarized data is pushed. The middle yellow box is Google Cloud Dataflow. This is where data is read, transformed, and enriched. The resulting dataset is loaded into Wave by using custom Source and Sink API developed specifically for Salesforce. Fully managed cloud service that eliminates need for a third party traditional ETL tool. Process batch and streaming data at scale and perform on the fly data aggregation, transformation and enrichment eliminating need to store data in a database. Easily connecting to Salesforce platform and Wave via the source and sink API allowing for faster deployment of solutions. springML is a new generation analytics company that provides data analytics applications and services that create value for our customers. We work with cutting edge technologies such as Salesforce Wave and Google Cloud Platform. In addition, we have built a library of industry vertical specific predictive algorithms. For example, these advanced predictive algorithms can learn from ads that had the most impact, and recommend ads to similar audiences on other websites. If you have an ad analytics use case, please do get in touch with us. We’d be happy to deploy the above app in your environment.